From the left: Dr. Agnes Mathilde Wergeland (with glasses) and Dr. Grace Hebard. The third person is unknown. 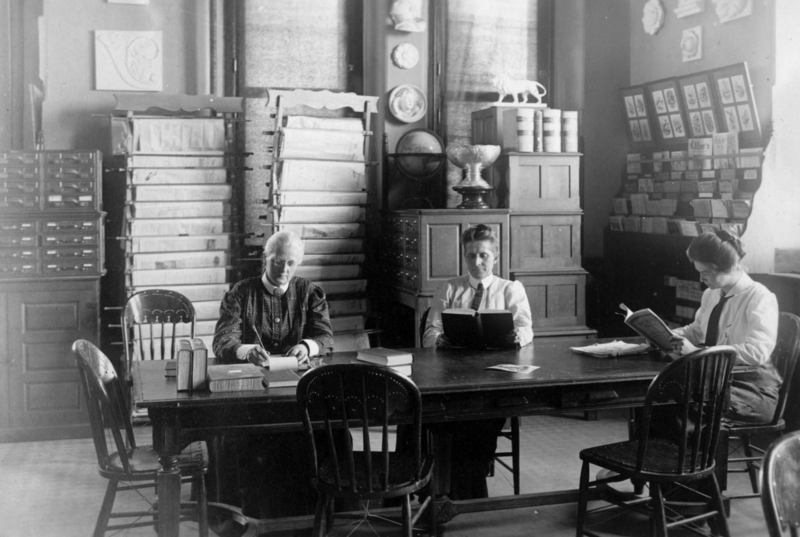 The photograph is taken in the library at University of Wyoming. Photo from the American Heritage Center digital collections, University of Wyoming. Agnes Mathilde Wergeland (1857-1914) was a Norwegian American poet and historian. Wergeland was born and raised in Kristiania. In 1916, Maren Michelet wrote a biography about the recently deceased Wergeland, who was the first Norwegian woman to achieve a doctorate. Wergeland had to emigrate to the United States to get a job at a university, because the Norwegian universities were not open to women yet. However, it turned out to be difficult to get a relevant job in the US as well. For 12 years, Dr. Wergeland lived in Chicago, trying to get a permanent position at the university. During this period, she lived with a miss Merrill, with whom she had a relationship. When, after 12 years, Dr. Wergeland got a job at University of Wyoming in 1902, she left Chicago and Miss Merrill. In Wyoming, Dr. Wergeland met, and moved in with, Dr. Grace Hebard. The 1916 biography describes this as an unusually happy domestic partnership. Together the two women built the house The Doctors’ Inn, and later also the log cabin Enebo on the lot Lille Norge (Little Norway) further up in the mountains. Their life together is described as the ultimate idyllic scene, with a cozy home, a group of close female friends, gardening, and caring for humans and animals in need. These two women also got 12 years together, before Agnes MAthilde Wergeland became sick, and died after a relatively short period of illness. Of her end, the biography writes: "In her dear friend’s arms, with a smile on her lips, she silently wandered, saying: 'Without you, life would have been impossible for me'". The photo is taken at the library of University of Wyoming. Dr. Agnes Mathilde Wergeland is to the left in glasses, Dr. Grace Hebard is next to her. The third person is unknown. Buraas, Anders. 1982. De reiste ut : syv fortellinger om Agnes Mathilde Wergeland, Ole Evinrude, Anders Furuseth, Knute Rockne, Harry Irgens Larsen, Hans Christian Heg, Ole Bornemann Bull . Oslo : Aschehoug. Gulliksen, Øyvind T.. 2009, 13. februar. "Agnes Wergeland". In Norsk biografisk leksikon . Read 11. april 2015 on https://nbl.snl.no/Agnes_Wergeland. Hellesund, Tone. 2007. "Agnes Mathilde Wergeland - professor og intimitetsinnovatør". Historie, populærhistorisk magasin 17, (3): 16-20. Mackey, Mike. 2014. "Grace Raymond Hebard: Shaping Wyoming's Past". Wyohistory.org. Hentet 22. februar 2018 fra https://www.wyohistory.org/encyclopedia/grace-raymond-hebard-shaping-wyomings-past. Michelet, Maren. 1916. Glimt fra Agnes Mathilde Wergelands liv . Minneapolis, Minn. : M. Michelet.